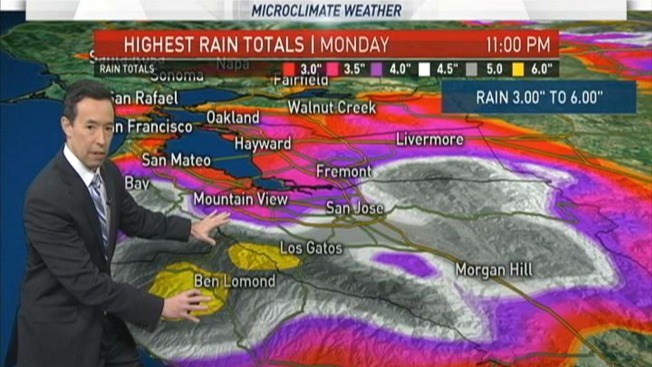 NBC Bay Area's Rob Mayeda pinpoints when a powerful storm will bring heavy rain to the region. Another powerful storm expected to douse the Bay Area Sunday night and Monday morning could pack threats of flooding, mudslides, toppled trees and power outages. Scattered showers on Sunday will transform into widespread rain around 11 p.m. Heavy downpours will continue into the Monday morning commute hours and consistent rain will continue to pound the region throughout the day. A flood warning was already in effect for Solano County as of Sunday evening to go along with flood watches for the rest of the Bay Area's eight other counties. Sunday night and Monday's storm is expected dump anywhere from one to three inches of rain across the Bay Area. Coastal mountains are expected to receive the brunt of that moisture with some spots receiving three to six inches of rainfall. This latest storm presents flooding concerns for areas already saturated by a wet winter. The San Lorenzo River near Felton, Alameda Creek along Niles Canyon Road and Coyote Creek near the San Jose neighborhood of Edenvale are all expected to reach flood stage by Monday afternoon. High flooding potential will also likely exist along the Uvas/Llagas Creek and San Francisquito Creek. Officials are also keeping a close eye on the Guadalupe River and creeks in the North Bay. High wind warnings were also in effect for all nine Bay Area counties as of Sunday evening. Gusts could reach 15 to 50 mph at times late Sunday and Monday.